The Shearing Shed is a only couple of metres from the main barn and is designed to be a multi-functional space for whatever our guests require. The main functions are as an additional bedroom, games room or treatment room for our mobile spa therapists. There is a Kingsize double bed with a the same high quality mattresses we have in the main bar as well as the same goose feather duvets ad pillows. There is a high quality mechanism which folds the bed up with one finger and is closed behind built cupboard doors. It comes with its own wardrobe and storage shelves too. 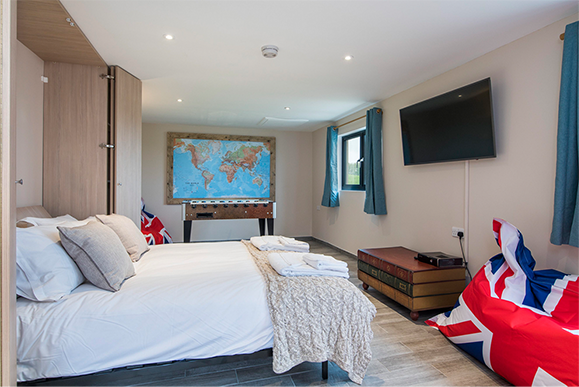 This makes it a peaceful bedroom away from the main activities of the big barn, ideal for those that wish to escape the hustle and bustle of the main group or prefer to sleep longer perhaps! The Shearing Shed has a big wooden table football, 50 inch LED TV, X-Box games console which can be used for watching movies too. 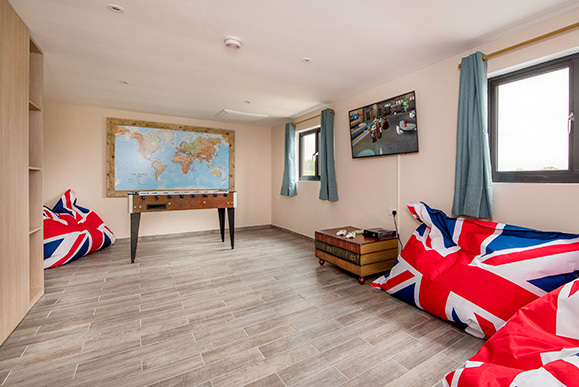 There are a number of huge bean bags for slumping on to watch a film or playing games from. It is great space to play board games on the floor too. Our spa therapist can set her treatment table up in this room, dim the light, close the black out curtains, put the music on and create a truly relaxing space. This can be for massages, facial, pedicures … she has a wide range of treatments she can offer. It works very well being away from the main barn as the peace and quiet in the Shearing Shed will help yo relax even more for your treatment. The Shearing Shed has a WC and is fully underfloor heated.